We were asked to price, cost and quote for an upgrade to an existing multi use games area at a college in York where they had an existing tarmac MUGA surface and wanted to change into a 3G third generation synthetic turf football pitch recreational area. 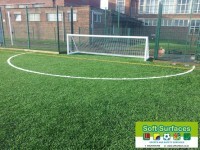 The client asked for the artificial grass supplier to be local and named Playrite as their preferred supplier so we sent samples of the conqueror 40 and conqueror 60 products both are which 3rd generation synthetic turf long piled sports surfacing ideal for football playing characteristics because is infilled with sand and rubber. As part of the whole package the project included extending the rebound fencing to allow for goal recess areas, supply and install new timber kickboards to the perimeter of the pitch, allow to aid existing drainage from the bitmac macadam surfacing and obviously supply and install the conqueror 60 synthetic sports surface which had inlaid lines installed and was infilled with sand and rubber. The dimensions of the sports pitch was a 60m x 40m multi use games area which allowed for three 5 a side football courts to run across the width of the MUGA. Running the full length of the pitch was line marked for 9aside soccer where the recessed goal stored the football sport equipment.